If you live in a dry, warm climate or simply want a cheaper and equally effective alternative to air conditioner, then an evaporative air cooler – also referred to as a swamp cooler may be a good option for you. Not only they will provide relief from the heat, they are highly energy efficient. So, using air cooler can also keep your electricity bill down. And since many of them work well outside, you can even use your air cooler for outdoor events and barbecues.When choosing a best evaporative cooler, look for one with multiple settings that allow you to control the temperature. Also, check to see if the airflow big enough to cover the room. Less investment, excellent performance : For same area, the cost for choosing evaporative air cooler is less than central air conditioner by 3/5. Less consumption, one hour only need 1 degree: For same area, the power consumption of evaporative air cooler is one eight less than the central air conditioner. Remarkable cooling effect: In southern region, the units can reduce temperature by 4-10 degrees, in the hot dry area, it can even reach 15 degrees. Good air quality: Evaporative air coolers have a stable performance in saving energy, lowing temperature and eliminating the dust and smell and they can also increase the oxygen levels to improve work efficiency. Natural air supply pr post air supply to choose. Adjust humidity: The swamp cooler unit can adjust the humidity of workplace. 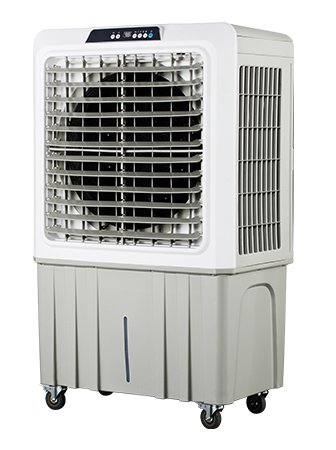 Easy-Maintenance: Air coolers are extremely popular for their efficiency, simplicity, affordability and low maintenance. Most of the maintenance jobs are DIY. What is the average humidity in your location? Evaporative coolers are effective in places featured by hot temperatures and low relative humidity. So, if the average humidity in your location is between 40-50%, then you might not need an evaporative cooler. Do you have water supply? Air coolers require plenty water since they use evaporation. This means that you need to have a lot of water in order to use it. How good is your ventilation? When swamp coolers are in operation, humidity in your home is bound to increase. Therefore, ventilation has to be excellent and if your home lacks ductwork, then you might need to keep your windows open. Calculate your CMH(m³/h) rating. Air coolers are rated by how much air the cooler can move, and is measured in cubic meter per hour (CMH). SQUARE METER AREA X CEILING HEIGHT X AIR EXCHANGE TIMES = CMH OF AIRFLOW NEEDED. 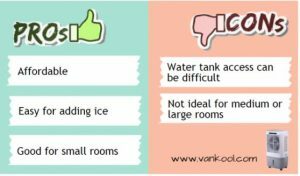 Determine the area of the space you want to cool. Multiply this figure by the height of your ceilings. Multip that number by 20 (20 for Air exchange times). The result is the CMH rating for the evaporative cooler you need. 50 square meters x 3 m ceilings x 20 =3,000 CMH. You need a unit rated at 3,000 CMH or higher. 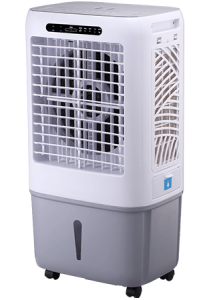 The Vankool VAB025-EQ Evaporative Air Cooler has a unique and durable design. It is treated with special agents that prevent it from rotting, or growing bacteria and algae. Plus, it cools efficiently without the high energy cost of an air-conditioner. Super low power consumption with cross flow fan that minimizes energy consumption & sound level in lowest speed setting – Ideal for long hours of quiet comfort at night. 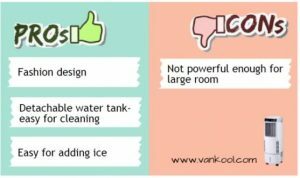 The Vankool VAB03-EQ indoor portable evaporative air cooler is one of the least expensive units we looked at. It strikes a balance between affordability and power. This portable swamp cooler’s airflow rating is 3000CMH (cubic meter per hour), which is good enough to cool medium-size bedrooms up to 20-30 square meter. 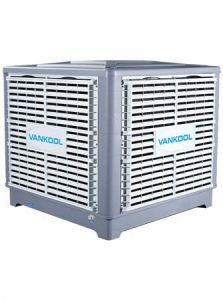 The Vankool VAB06-EQ is a good evaporative cooler for large workshops and patios. 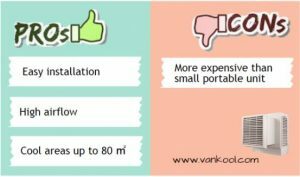 It can cool areas up to 45-60 square meter, which is substantially more space than most portable evaporative coolers we looked at can handle. Ideal for large open rooms, patio/ BBQ areas, garage, deck, backyard, warehouse. Double high-pressure blowers produce vigorous, long airflow for long spaces. Auto-close shutters help keep out dust & insects when off, Low Water Alarm, Automatic Off timer & remote control. Not just a fan – air cooler reduces temperature through water evaporation. Moist, cool breeze can cool you down without spraying floor & furniture with water. Super Low power consumption, continuous water supply connection & thick Honeycomb Cooling Pads for optimal evaporative cooling all day long. 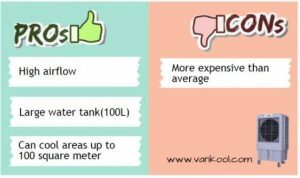 Cut cooling costs with the Vankool VAB015-EQ , 15000 Cubic meter Per hour (CMH) Evaporative Cooler. This mobile swamp cooler is great for use in hot, dry climates or for those who want to lower their reliance on air conditioners in industrial environments. 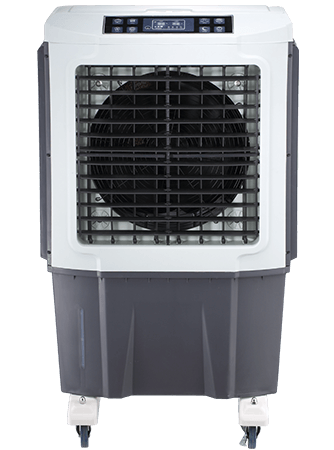 Capable of cooling the air in spaces up to 60-100 square meter, it’s ideal for use in warehouses, garages, workshops, or outdoor decks and patios. Perfect size for restaurants, patios, shops, weddings, barns and garages. A shut-down valve on the PUMP when water gets low, ensuring that your internal parts don’t over-work. An easy to open flap for filling the water, with an attached water tank (100L) lasting 8-10 hours. For continuous flow, includes hose attachment with float valve system inside. Drain valve located on the bottom of the tank for emptying the reservoir. No assembly required – only attach the wheels. Two-part horizontal louvers, giving the ability to blow up and down at the same time . The Vankool VABW08-EQ evaporative window cooler is built for high performance, easy installation and low maintenance. 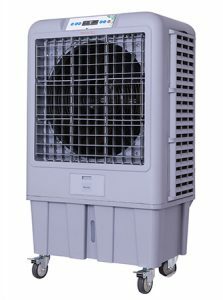 Set the neck of these coolers into an open window to deliver cooled air to one or more rooms or connected spaces. 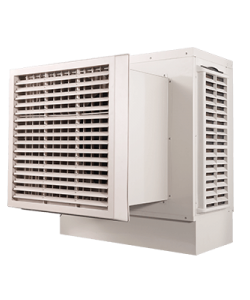 The largest part of the cooler sits outside of the window for maximum exposure to fresh air, and the air outlet sits in the window similar to a standard window AC unit. 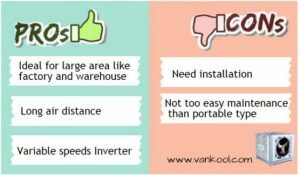 The Vankool VAB18-IQ is Air Ducted industrial Evaporative Cooler, Provides Indoor & Outdoor Cooling for Most Industrial, Commercial and Residential, 18000 CMH Max Air Flow. Distribute cool air through ductwork to cover large areas, multiple rooms, and whole homes. A blower wheel design with self-aligning bearings for efficient, quiet operation. Cools up to 100-150 square meter for large area cooling. Rugged, rust- and corrosion-resistant, bolted design for smooth, quiet, long service. Louvers are easy to remove for service. One of the best ways to maximize you evaporative cooler is to ensure that the room has proper ventilation. Air coolers use the principle of evaporation where hot air is passed through cooling pads. Hence, you need to have constant airflow for the cooling process. A strategic location to place your air cooler is in front of the window. It allows hot air to be drawn faster and more cool air will be blown out of the cooler. Ensuring that you have good ventilation in the room is equally important in propelling humidity out. A simple way to maintain the humidity low is to keep the windows open at least 2 inches. This will enable air to flow in and out smoothly. Allowing air to move freely helps to disperse moisture in the air enabling more air to escape. Avoid keeping the windows wide open as it will only escalate the room temperature. You can try this by adjusting the window to obtain better cooling. Even though it might seem to you that hot water evaporates faster being near the boiling point, it’s not true. Cold water is more effective in a swamp cooler and the hotter the water gets, the lower the performance. A physics research indicates that the optimal water temperature is 50 degrees (approximately that which you get on tap water). This temperature works best with evaporative coolers while performance reduces as the warmth increases. An alternative to using cold water that increases cooling is adding ice into the water reservoir. Most user have experimented this with their coolers, and it works well. As a matter of fact, some coolers are designed with ice compartments. Addition of ice into the water cools the pads more making the air passing them cooler. However, cold water is not quite effective. With respect to the study; 50 degrees is the best temperature. 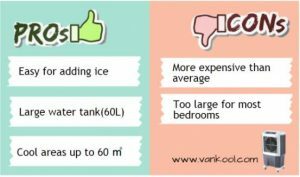 Adding ice cools the water to around 30-40 degrees which is not effective since the ice should melt before evaporating. Considering that it will take some time, it does not add much efficiency to the cooling process. In short, swamp coolers are effective in places with a relative humidity of approximately 70%. When humidity goes beyond this, the cooler becomes lesser effective and might even make the situation worse by dampening the water. If the temperature around your area is too hot for opening a window, then you should get a dehumidifier. This device will also be helpful if you live in areas with high humidity or your home is humid. It collects excess moisture contained in the air in your home into a water tank which can be emptied. Even when it’s used alone, it can keep your room cooler during summer on humid days. They will make air drier which aids the process of natural perspiration on your body. It also makes the evaporative cooler more effective through the same process. To enhance its performance, keep the dehumidifier next to where air enters the evaporative cooler. It will ensure that high amounts of dry air is enters the system for excellent evaporation. Adding houseplants to your home will help in reducing the extra moisture by sucking them up. Many plants use moisture in the air to satisfy their water demands, and they will keep your house drier. For example, when you place several cacti plats in small pots near your home, you’ll notice the change humidity. A Boston fern is another great choice to keep air dry. Apart from that, the plants keep the air pure and clean. When the swamp coolers begin running, the pads will take some time to get wet. After they absorb water, the water from the tank will keep them wet. But, the pads can require up to 15 minutes to become fully saturated when starting. Prior to starting the fan, fill the water tank and allow the pads to absorb water. This will help you conserve some energy instead of blowing hot air before the device attains its favorable cooling capacity. Tip: after the pads get water-soaked, fill the water tank before starting the fan. 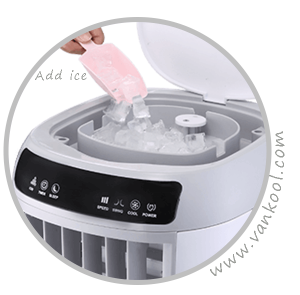 It will enable you to maintain the air cooler for a long time before the next refilling. Wipe the outside parts of the cooler. Vacuum the fans and air intake grills. Clean the air cooler water reservoir using mild soap and water. Examine the cooling pads to check for mildew or cracks, do replacement if needed. Before you keep the swamp cooler for winter, ensure that the device is properly cleaned and no water is left in the system. Avoid packing it until all the water has drained out even on the cooling pads. Keeping it with water will result to build up of mildew and other issues in the coming spring. Swamp cooler thermostats which are found in various hardware shops turns of the cooler automatically once the optimum air temperature is attained. This makes using the cooler much easier. Majority of the evaporative coolers that lack thermostats have different switches for the pump and fan. If your device doesn’t have a thermostat, let the pump operate for some few minutes prior to starting the fan. This will allow the pads to saturate. This unit is effective in cleaning water from the system resulting to clean air. Purging the water will make the pads last long. Varying pumps operate at different purging intervals such as every 8 or 6 hrs. 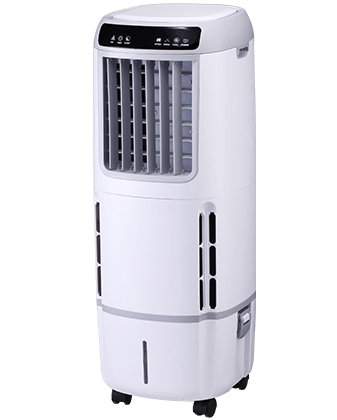 Evaporative cooler are effective when the air drained in and air blown out is balanced. One way of achieving balance is keeping the window slightly opened. However, if you need to keep your windows closed, installing ceiling vents will help keep the air balanced. To keep your water from turning brackish, installing a bleed-off system that infuses the cooler with fresh water is advised. This will cut down the maintenance needs in order to keep the system operational, but it will need extra 5 gal of water every hour.